Blending a lengthy background in marketing and 25 years of trade knowledge surrounding real estate, Drew & Linda Irvine are the perfect recipe for success. Originally from New England, Drew has an artistic eye for effective home staging and years of experience in sales and marketing. Linda, originally from the west coast of Florida, brings years of trade knowledge including mortgage origination, title, and experience dealing with closing agents, appraisers and surveyors. Their combined strengths, dual availability, outgoing personalities and true professionalism make them an effective and capable team in any real estate transaction. Whether dealing with homeowners or future homeowners, Drew & Linda are always working to make people feel at ease when buying or selling a home. One thing that is constantly said about this team is that their style and personalities makes people feel instantly comfortable and relaxed. They know that this process can often be stressful and are always striving to make their clients feel confident and secure as they buy or sell a home. 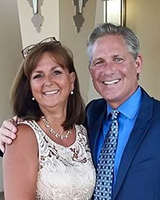 Drew & Linda also pride themselves in their passion and heartfelt drive to stay ahead of the game when it comes to market education, trends and technology. They are familiar with upcoming development and exciting changes in our Treasure Coast and love to put their expertise to use for their clients. Drew & Linda have three children and are expecting their first grandchild in September. As avid foodies and music lovers, you will often find them trying new restaurants, dancing to local music and attending neighborhood festivals. If you’re looking for someone with a wide range of experience and commitment to their clients, look no further than the Irvine Team.